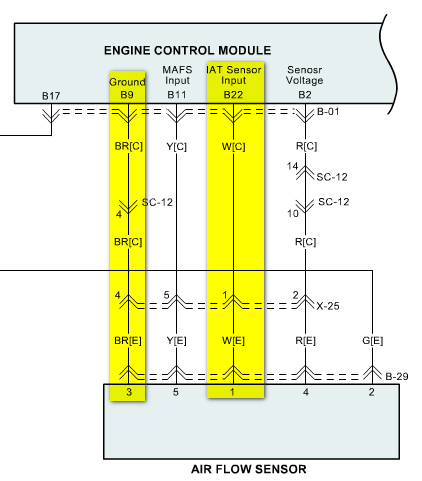 Technical Car Experts Answers everything you need: 2004 Kia Sorento: Two IAT Sensor wires? The MAF( Mass Air Flow) Sensor Connector has 5 wires.Out of that 5 wires 2 wires are for IAT( Intake Air Temperature) Sensor. In this 5 wires the two wires on the MAF/IAT sensor for the IAT sensor are white for IAT sensor power and brown for ground. 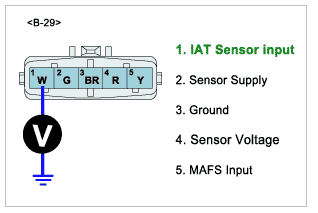 MAF/IAT 5 Plug wire connector layout diagram.